1. Weave a base using 8 x 8 paper strips. For a basket measuring 11 x 11 cm use the wide paper strips. 2. Glue as shown in the photo and cut off excess strips. 3. Fold along the two outer layers of all four lengths. 4. Punch holes with a fiskars eyelet setter in all four corners as shown in the photo. 6. 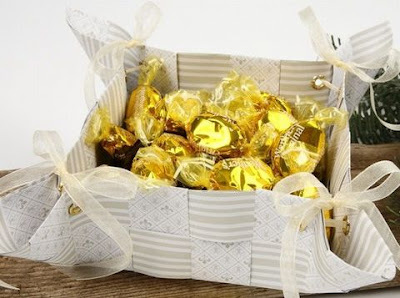 The basket gets its shape by gathering all the corners with organza ribbon.